McHenry Snow Removal Services – Everything you need to Know! Chicago’s snow history is well-documented and not to be taken lightly. We can get 24″ of snow a falling! Buried cars to congested parking lots, in McHenry County we know it’s important to have the best snow removal company. McHenry Usually Gets Snow in November! Although many may be looking towards spring and thinking not planning on the winter, locals know that snowstorms often occur in November in Algonquin, Crystal Lake, Cary, Fox River Grove, McHenry, Woodstock and Barrington. When choosing your snow removal company in McHenry county, it’s important to select a firm with the equipment to get the job done quickly and done right! 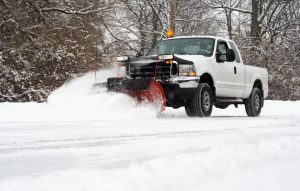 We use heavy-duty trucks, and de-icing equipment to ensure our heavy snow won’t slow you down. Most of our snowfalls require strategic planning and specialized approaches to the clearing. Many snow removal companies may plow your lot clear, but what happens with all the snow? It gets pushed to the side forming a huge pile most likely. Visibility is reduced and vehicles may still be obstructed from freely navigating your parking area. We can relocated your snow! Or we can melt it right there! We’ll plan with you which is the best option, to leave it, relocate or melt. When the weather gets nasty, it’s comforting to have a snow and ice removal company that gives personalized service. How is your snow plow company communicating with you about when they will be there and what services they provided? We offer email alerts during all aspects of a storm so you don’t have to guess. Customers get special treatment — ours and yours. We take care of your sidewalks so your customers and employees are safe. We consult with you to decide what’s best for your business — snow blowing, salt, or shoveling — and we make it happen. Word of mouth marketing is the best marketing. Check what the internet is saying about the firm you may choose. You’ll find Admiral Grow Green to have stellar reviews online. We can’t make everyone happy, but we’ll do what it takes to do our best to make you happy. Admiral Grow Green is a McHenry County based Lawn & Outdoor company located in Algonquin. Providing lawn care services including lawn moving, aeration, dethatching, natural fertilizer and weed control services in the summer and snow removal services in the winter. AGG is locally family owned business using only the best natural solutions for your lawn and yard. With a very satisfied customer base, AGG’s services and prices simply provide the best value available in Algonquin, Cary, Crystal Lake, Fox River Grove, Barrington, McHenry & Woodstock.